Recipe Makeovers simply means, recipes that you would want to make over and over again! The cover picture is Eggplant Pirogue and was submitted by Just a Pinch member Donna Graffagnino and can be found in the Min Dish section. Thank you Melanie for sharing it with us! Looks like a darn good soup! 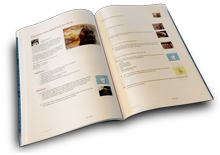 Thank you Tammy for including one of my recipes in your cookbook! It's truly a pleasure for to cook and awesome that you liked mine enough to include! Anita, I love your recipes and I am so happy to have them included. Thank you for sharing them with all us! I love cakes and pies and look forward to trying those! Thank you so much for including my recipes Chocolate Sour Cream Walnut Bundt Cake and Decadent Chocolate Pecan Pie. Your book has so many great recipes that I can hardly wait to try. I am also honored to be included in your book. Thank you. Honored to be included. Welcome Kathy! Thank you for the yummy dressing recipe! I love Caesar Salads! Great cookbook! Thanks for including one of my recipes, Tammy. Your welcome Ellen! I love having your recipes and can't wait to try this one! Hugs!! Thanks so much, Tammy, for including my new recipe CHICKEN & PENNE GORGONZOLA in this great cookbook! Your cookbooks are the best!